This report by Ken Adams is the first in a series for CBSNews.com chronicling his run at the 2005 World Series of Poker in Las Vegas. For each of the past 18 years I have set aside work, family and everything else for a brief time to travel to Las Vegas for the annual World Series of Poker ("WSOP"). This year the WSOP began June 2 and will continue until July 15. There are 41 separate events – including the Big Deal, the No Limit Hold'em Championship -- and so 41 poker players will realize the dream of winning a World Series title. I am hoping to be one of them, just like the 20,000 other players from the United States and 15 foreign countries. You could say the odds are long. 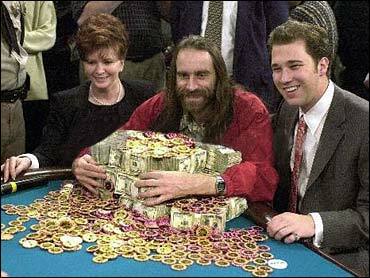 This year's WSOP will be the largest and richest in history, by far. Poker is red hot. Fueled by the invention of online poker and fancy cameras that make it possible for television viewers to see the players' hidden cards, the old kitchen table card game has become a big money spectator sport. In 1987 when I went to the WSOP for the first time, only 152 players paid the $10,000 entry fee to compete for the world championship. The winner that year, Johnny Chan, won $655,000 along with the treasured championship gold bracelet. Last year 2,576 players put up $10,000 each in the championship event. Greg ("Fossilman") Raymer, a patent lawyer from Connecticut, won the championship bracelet and a whopping $5 million for his first place finish. Each of the top four finishers in that tournament won more than $1 million. This year's tournament organizers are preparing for as many as 6,600 players in the championship event that will begin on July 7 after the 40 other events have finished. The total prize money in all 41 events is expected to top $100 million. Deal the cards. For amateurs like me who spend most of the year going to work and living ordinary lives, interrupted by the occasional poker game with friends, the WSOP is like a feeding frenzy in a school of sharks. Tens of thousands of poker players gather under one huge roof for six weeks, playing poker 24/7. Every day there is another tournament event you can compete in. For those who like to play seven card stud, there will be five stud events with entry fees ranging from $1,000 to $5,000. There will be seven Omaha events, with entry fees from $1,500 to $10,000. The most popular game these days is Texas Hold'em. This year there will be twenty-seven Hold'em events, including six limit Hold'em tournaments, four pot limit tournaments, and seventeen no limit events, with a range of entry fees from $500 to $10,000. Every day there are single table and multi-table "satellite" tournaments where you can try to win enough to buy into the upcoming events. And there dozens of "side games" – cash games unrelated to the tournament, that break out all over the place among players at all levels. The action is nonstop. At every one of hundreds of poker tables, at every minute of every day, the law of the jungle is at work. It is "eat or be eaten," because every tournament player starts out with the same number of chips and when your chips are gone you are gone. No videotape replays. No appeals to fairness or higher authority. No buying more chips. No excuses. No second chances. The weak and unlucky are defeated; the strong and the fortunate survive to play on. Darwin would love it (if he had the cards). As I prepare for my annual plunge into the shark infested Vegas desert, I ponder the strategic consequences of the huge increase in players. To prepare for the sharks I have played in as many local tournaments as possible. I have reviewed the underlined sections in my tattered poker textbooks, written by the great tournament players of the past and present. I will re-read my detailed notes of prior tournaments, hoping to avoid the mistakes this year that have cost me in the past. I will review my notes from the weekend poker camp (yes, poker camp) I attended earlier this year, where I picked up pointers from some of the most successful tournament professionals in the world. I will play some online tournaments. I will follow the daily progress of friends who are playing in the first week's events. I will think about whether the increased size of this year's fields should lead me to play more aggressively or less so in the early rounds, and dozens of other such choices I will have to make once I get to Las Vegas and sit down at the tables. Should I routinely fold hands like 7-7 before the flop, even though that is not the optimal theoretical play, because I have had so much difficulty playing middle pairs after the flop in prior tournaments? When I raise before the flop with A-K will I always follow up with a continuation bet after the flop, whether or not the flop improves my hand? In my young days I played competitive tennis and went to Forest Hills each year to watch the U.S. Open. I never got to compete against Rod Laver or Arthur Ashe. But each year at the World Series of Poker I get to play hands against former world champions like Doyle Brunson, Johnny Chan, Chris ("Jesus") Ferguson, and the other legends of the card table. I do not expect to outplay them, but there is an element of luck in all card games that means that occasionally I get to win a pot from them. Last year, I bluffed 2003 champion Chris Moneymaker out of a pot and it felt great. My goal this year is to play my best game, to make good decisions, and not to let occasional unlucky outcomes put me on tilt. It takes exceptional discipline, toughness and concentration to do that for ten to twelve hours a day, while facing down a table of predators that are waiting to pounce on the slightest mistake or show of weakness. Only the top professionals can do it with a high degree of success. I intend to do better than last year when I played in three events and finished "in the money" in one. At least that's my plan. Ken Adams, attending his 18th World Series of Poker, is an attorney in Washington, D.C. He was ranked third by Washingtonian Magazines "The 75 Best Lawyers in Washington" in 2005. He has also written about the WSOP for Card Player magazine.